How Long Should I Run My Lawn Sprinklers? Have you heard the saying summer lawns are made in spring? If your lawn is suffering from all the dry weather we’re having this winter, now would be the perfect time to invest in some lawn sprinklers. For those who have made the leap to sprinklers already, we often get asked how long you need to run them to get your lawn looking green and healthy. As you might expect, there is no single, definitive answer to this but we’ll provide you with a few pointers. The main reason why we advise people to start preparing their lawn in spring is not only because the lack of water at the moment has probably caused your lawn to dry out and start looking very brown if you’re not watering it regularly, but also because milder spring temperatures favour good root growth and the roots supply water to the grass blades. So our advice is to water your lawn thoroughly and infrequently as this encourages deeper roots and deeper roots help lawns to prosper in hotter weather. Deep rooted lawns can pull water from deeper depths and can wait several days between watering. This means they are stronger and less susceptible to disease and funghi. While it might sound counter-productive, giving your lawn a really good water a couple of times a week is far better than short periods of watering every day. It’s also best to water your lawns in the morning as lawns absorb water through the process of photosynthesis and this can only happen efficiently during daylight hours. If you water your lawn at night, much less of the water is absorbed and ends up running off. This is particularly problematic if you’re using fertilisers which just end up being run off into the water table and potentially polluting the environment. Not all grass types require the same amount of water. To many Australians, grass is just grass but if you’re interested enough to care about how much water your lawn needs, it’s worth paying attention to the type of grass you have. Some common varieties in Australia include: Kikuyu Grass (very durable and often used in schools and sports fields); Buffalo Grass (very durable, easy to grow and maintain); Couch Grass (easy-going and cheaper grass which can make for a great-looking lawn when treated correctly) and Tall Fescue (a cool season ‘instant-lawn’ variety though not quite as durable as some of the others). Cool season lawns require about 20% more water than warm season grasses. 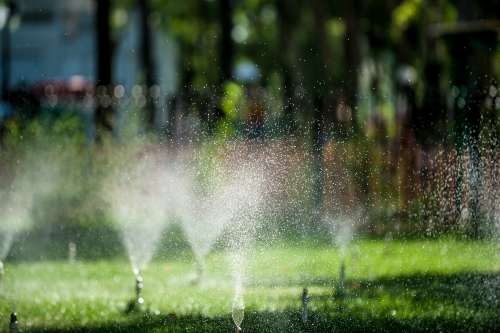 Keeping your lawn lush and green throughout the year really isn’t that difficult and a decent sprinkler system will make for an easier job all round. Call in or browse our website to get all the lawn sprinkler parts you need to get a beautiful, healthy looking lawn.